Beginning next year, professors at various United States universities, including the University of Wisconsin, will be able to give lectures in classrooms other than 400-plus-seat lecture halls as a result of the "Indo-U.S. Inter-University Collaborative Initiative in Higher Education and Research." An international alliance between 15 American universities, three Indian universities, three global corporations and the Indian government will utilize their country&apos;s EDUSAT satellite. The alliance is financially supported by Microsoft, Qualcomm and Cadence, with other multi-national corporations expected to join. EDUSAT, sent into space last year, is India&apos;s first educational satellite. It will allow American instructors to lead classes in remote classrooms, thousands of miles away, via Web cast. "Any Indian village could set up a receiving station and receive a signal, and schools would need only a computer and a simple Web camera to view the lessons," Sanjay Limaye, senior scientist at the UW-Madison Space Science and Engineering Center, said in a release. The instruction and research between American and Indian universities will focus primarily in the fields of science and engineering, although it is not limited to these areas. UW&apos;s contributions to the collaboration will be in pre-college science education, according to Limaye, who specializes in creating and promoting science educational materials. Specific programs and initiatives involved in the collaboration will not be hammered out until next year, Limaye said. The University of Wisconsin is currently represented in the alliance by Limaye and Rosalyn Pertzborn, the director of the SSEC&apos;s office of Space Science Education. "I think [the collaboration] is a great idea," UW Astronomy professor Andres Sheinis said. "But it&apos;s not perfect, as the human interaction that is important to teaching is lost." He said that the "dissemination of information over a broad area is a good use of resources," but language barriers may be a concern. "Of course one would have to worry about language barriers, as distance only exacerbates that situation," Sheinis said. "It would be absolutely necessary to have motivated students on the other side." 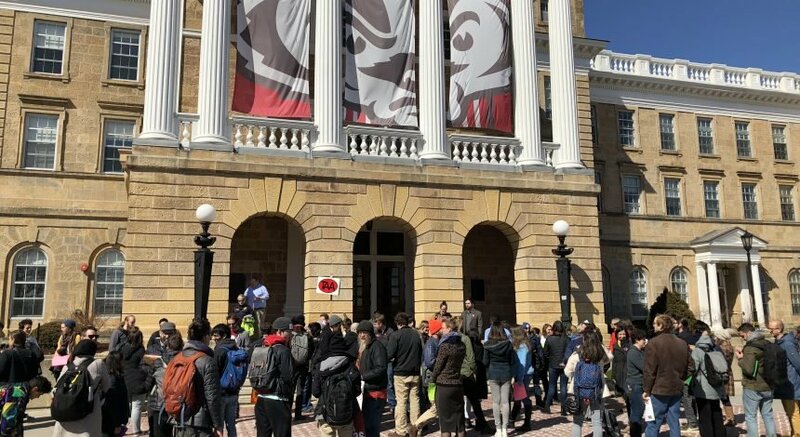 UW education professor Peter Hewson said he shares that opinion, adding access to the technology "on the other end" would be extremely important for this "huge opportunity" to be realized. This pooling of resources is not the first instance that a satellite has been used to transmit lessons over geographic barriers. There is a similar system set up in Hawaii, according to Sheinis, where classes on one island are transmitted to other islands. "In principle, finding ways to alleviate educational shortcomings is a great accomplishment," Hewson said. Other American universities involved include Harvard, Princeton, Yale, Purdue, the University of Texas at Austin, the University of Washington, the University of California at Santa Cruz, the University of California at Los Angeles; the University of Massachusetts, Amherst; Georgia Institute of Technology, the University of Illinois at Urbana-Champaign and the University of North Dakota.